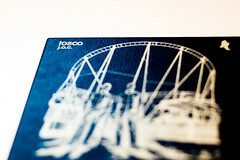 Today I got the latest Tosca CD from Amazon. Tosca are one of my favorites artists and Nat was lucky enough to see them live when they came to Lebanon a few years ago. I have every one of their albums plus a couple of their singles. There latest album j.a.c. is incredible, I really love their style, its totally unmatched.